USANA, word! : 777 Project: Completed! Wow, what an amazing achievement for our USANA Ambassador, Mike Allsop – Mike has successfully completed an incredible seven marathons, on seven continents, in seven days - 7 days 21 hours and 45 minutes to be precise! 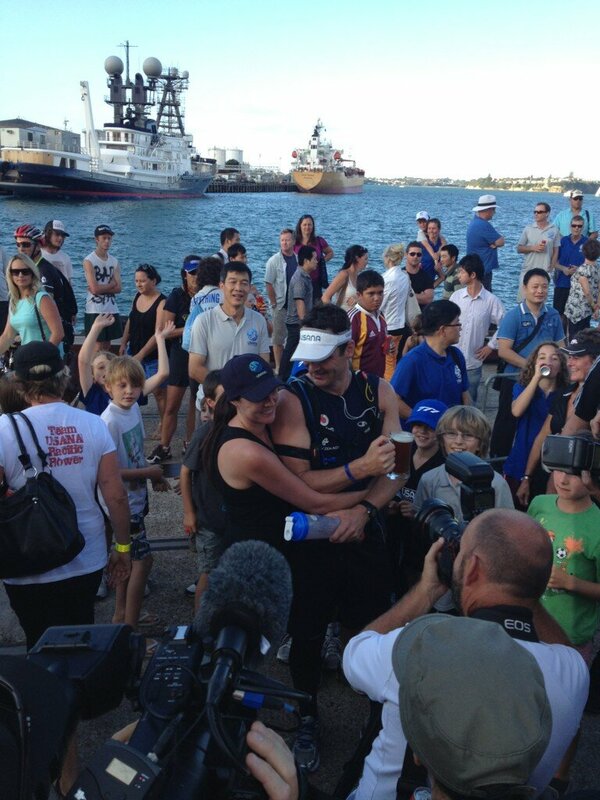 As well as the length and intensity of his challenge, Mike had little time to recover between each marathon. He had to deal with a variety of elements along the way, from the windy Falklands, the heat of Chile, and the winter cold of London. 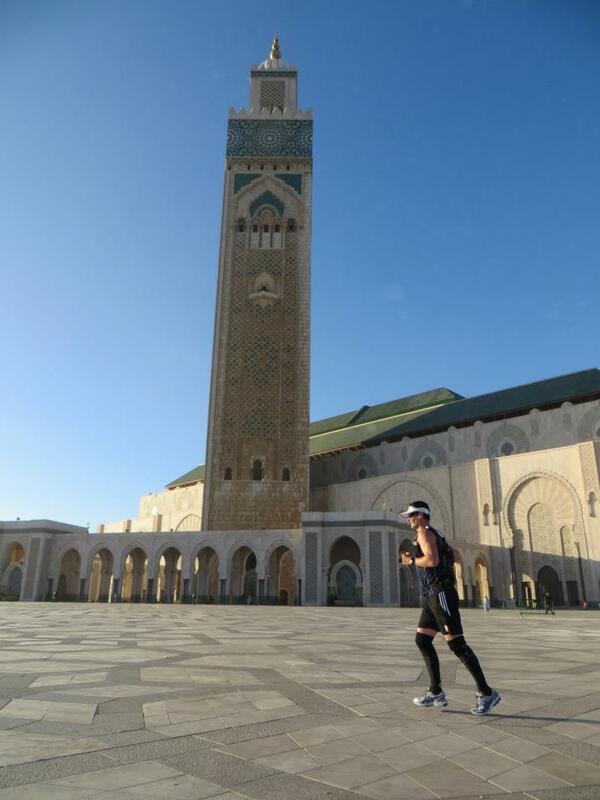 Mike ran the Casablanca leg of his epic feat in the middle of the night finishing at 1:30am due to a delayed flight! 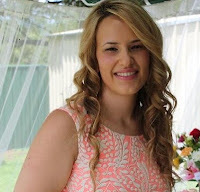 The marvel that is Mike ran a total of 295.4 kilometres – that’s more than the distance from Sydney to Canberra. And he burnt over 22,000 calories which is equivalent to eating 40 Big Mac’s over the week. Now that’s a lot of calories! Mike kept himself fuelled with USANA NutrimealTM and Nutrition Bars throughout the whole project. 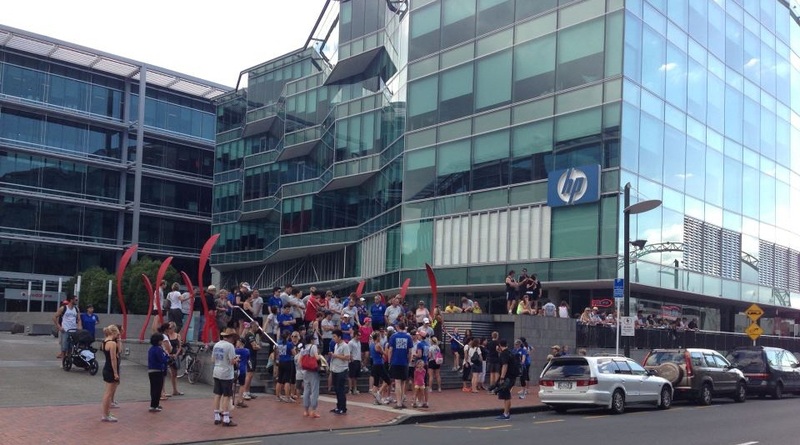 There was plenty of support for Mike along the way with USANA Associates turning out to cheer him on along the way – showing their support, boosting motivation and even running alongside Mike to show their support to provide some well-needed encouragement around the world. Arriving in the chilly Falkland Islands which is located near Antarctica, Mike started his run in fine form completing marathon number one in 4 hours and 59 minutes. Next stop was Santiago, Chile in South America. 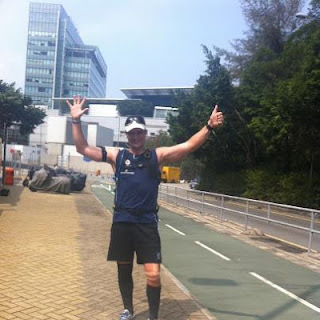 This was a tough one as Mike battled the hot South American temperatures yet he completed marathon number two in five hours and 35 minutes. 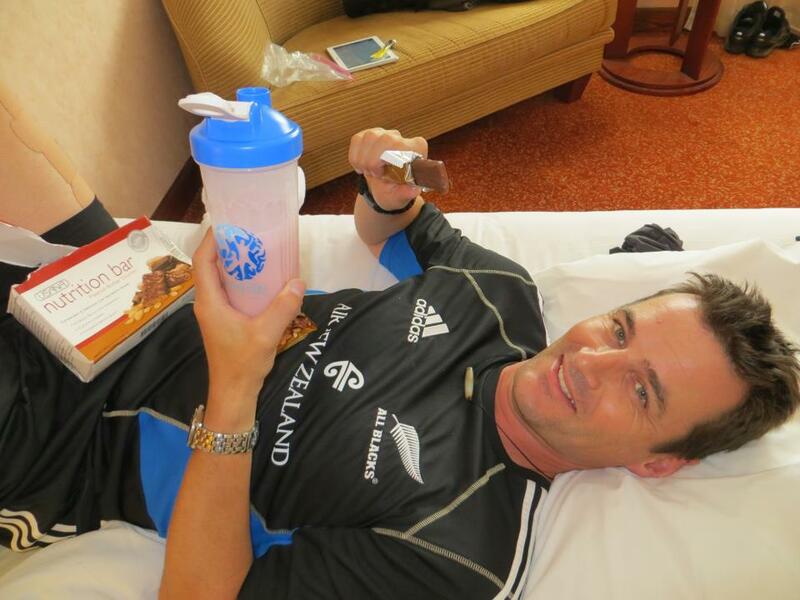 After jumping on a plane to Los Angeles, California, Mike began his third challenge boosted by 1-Star Diamond Director Michael Callejas and his enthusiastic team of USANA Associates! 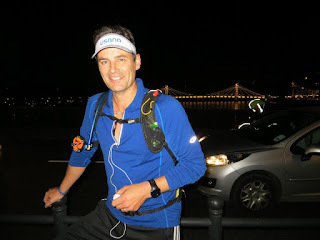 The halfway mark – London bound! Making the flight from Los Angeles to London by the skin of his teeth (just six minutes to be precise! ), Mike settled back for a well-deserved rest during the 10-hour flight. 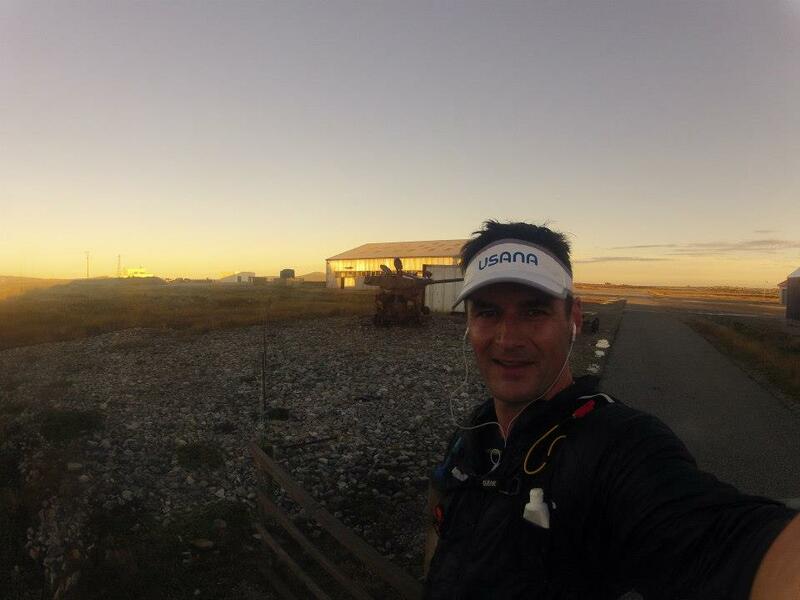 Soon after landing, he was back in action and successfully completed his fourth marathon! After a delayed flight, customs, traffic and taxi troubles, Mike finally made it to Casablanca in Morocco, North Africa for his fifth marathon. 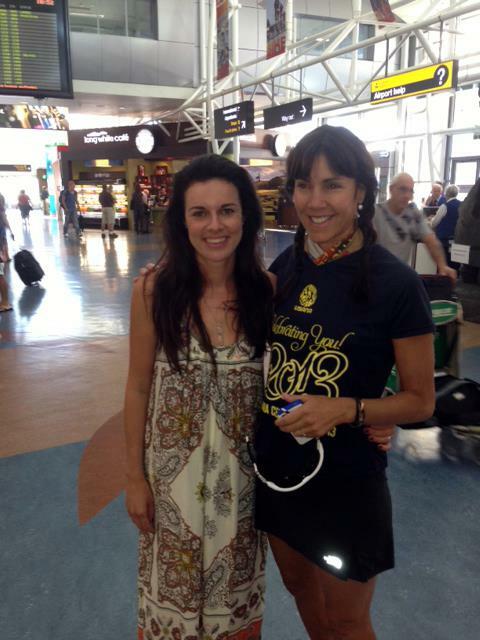 Completed in six hours and 54 minutes – what an incredible athlete! 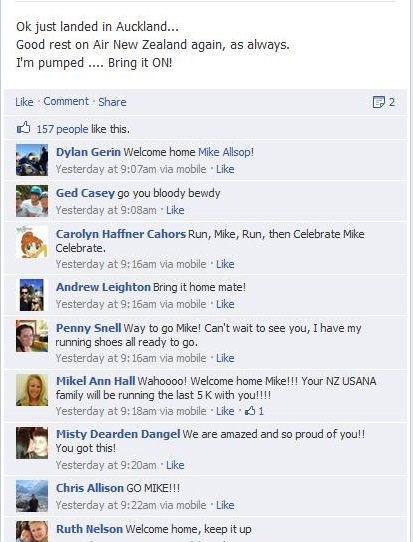 Mike was inundated with positive support on social media including daily posts on Facebook and Twitter from USANA Associates and fans worldwide. Next stop – Hong Kong! Mike rested and recharged for marathon number six during the 22 hour long flight from Casablanca to Hong Kong. 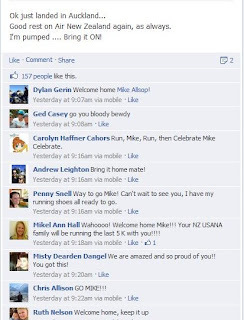 With the 777 Project finish line firmly in his sights, Mike was met by some enthusiastic USANA Associates who warmly welcomed him in the early hours of the morning. 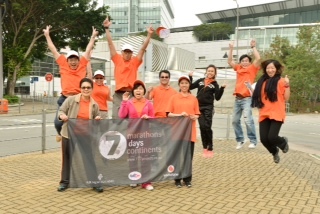 USANA Associates in Hong Kong cheering Mike on! Then, the moment that everyone had been waiting for finally arrived – it was Sunday the 24th of February 2013 when Mike’s Air New Zealand flight NZ38 arrived in Auckland, New Zealand. Mike was met by his wife Wendy Allsop and his friend, support runner and fellow USANA Ambassador, Lisa Tamati. It was the end of the 777 Project and Mike was on home soil; he had the support of his family, friends and local supporters as well as well-wishers worldwide. 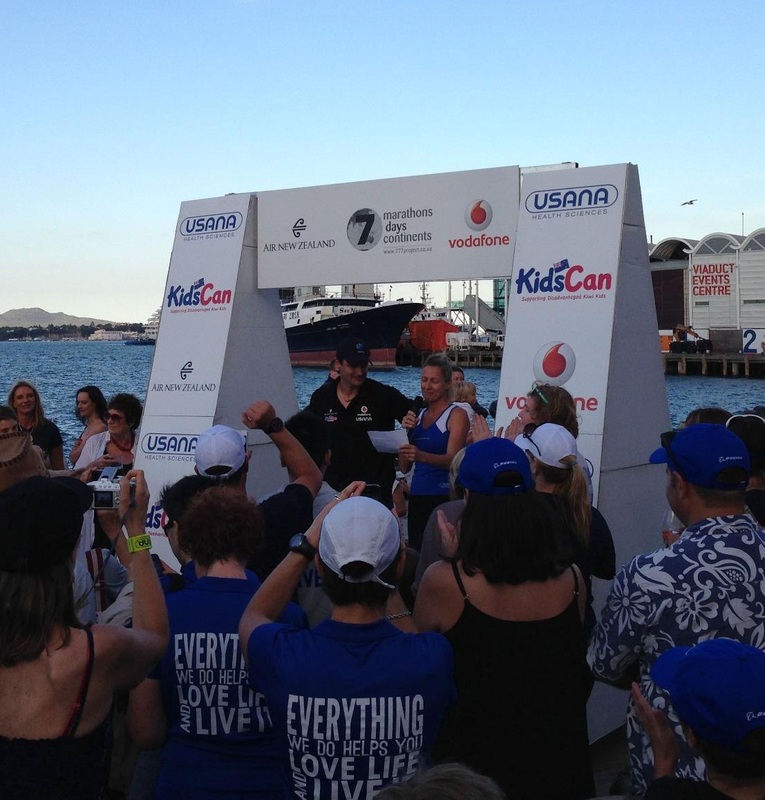 USANA was there to support him in the last 5km of the 777 Project! 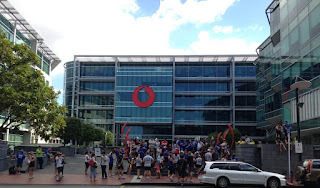 A sea of blue and grey USANA Associates gathered at the Vodafone Hub ready to join Mike and Lisa in the final 5km of the 777 Project. The atmosphere was electric and it was truly a once in a lifetime experience for those who were lucky enough to join Mike in completing his 777 Project adventure. ﻿Mike successfully completed his ambitious 777 Project and we couldn’t be more proud of his achievement – and neither can the kids of KidsCan who will benefit from his incredible feat! 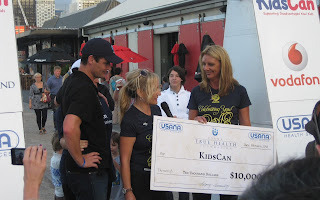 The USANA True Health Foundation has officially donated a total of $10,000 NZ to Mike’s chosen charity, KidsCan. 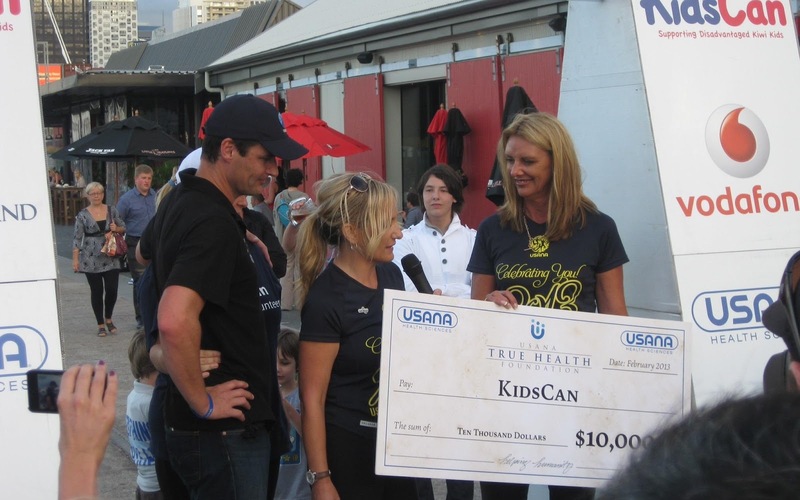 A $2000 cheque from the USANA True Health Foundation was presented to Mike at Celebration in Auckland to kick-start his journey. And, for each marathon Mike completed, Mike collected another $1000. Shortly after Mike crossed the finish line completing his incredible worldwide journey and The 777 Project, Mike accepted the final $1000 cheque. The donations will be specifically directed toward the KidsCan Shoes for Kids and Food for Kids programs. Congratulations Mike! All of us at USANA are honoured to have supported you throughout your mission and fully support your honourable fund-raising to help disadvantaged children in New Zealand. We can’t wait to see what the future holds for you now! Whatever it is, and whatever you choose to do, we know it will be amazing!